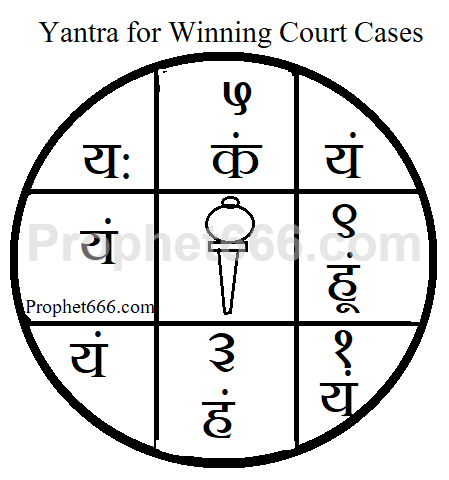 Another Yantra to get the verdict in your favor in court cases or litigation has been described by me in this post. Wearing this Yantra, which is called as the Mukadme Me Jeet Pane Ka Yantra, on the day of the verdict, argument or hearing is said to make things go your way and according to your exceptions. 1] The most auspicious period for preparing this Yantra is during the Ravi-Pushya Yoga, which falls during the Brahma Muhurat on the night of a Sunday, but before Sunrise on Monday. This is considered to be a Siddh Yog for making this Yantra and make it most effective and powerful. 2] The Yantra must be drawn on a Red Bhojpatra using a mixture of Sandalwood Paste Safeed Chandan], Turmeric Paste [Haldi] and Saffron [Kesar] as the ink. An Anar Kalam[small pointed stick of the pomegranate tree] should be used as the pen. 3] The Yantra should be folded and place inside a Copper or Silver locket and tied with a Red Colored Thread [Lal Dhaga] or Copper Chain [Tambe Ki Zanjeer] and worn around the neck like a good luck attraction charm. 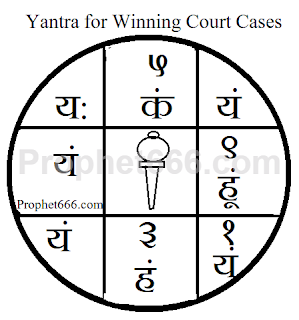 You can also see a few Yantras for getting the court verdict in your favor, which were published some time earlier. For finding Mantras, Tantras or Upay for legal problems, please use “Search This Site” to find a remedy you like.